With oyster aquaculture production one of our regions top industries, more and more people that visit the area may find themselves in the presence of oyster bars, or having them on the menu. Even here, you can find a variety of different types of oysters. We found this press release from NOAA Fisheries to be a great introduction to our little friends, especially for visitors that may not have had the chance try them. Size Matters: According to Patrick Hudson from True Chesapeake Oyster Company, “most of the oysters you find at an oyster bar are around three inches in length; this is often referred to as marketable size.” However, different sizes of oysters can be ordered depending on the consumer’s preferences. At True Chesapeake Oyster Company the common marketable size oyster is known as the skinny dipper while their larger oysters have earned them the name chunky dunkers. “We find that oyster preference varies from person to person, but it often varies by region too. 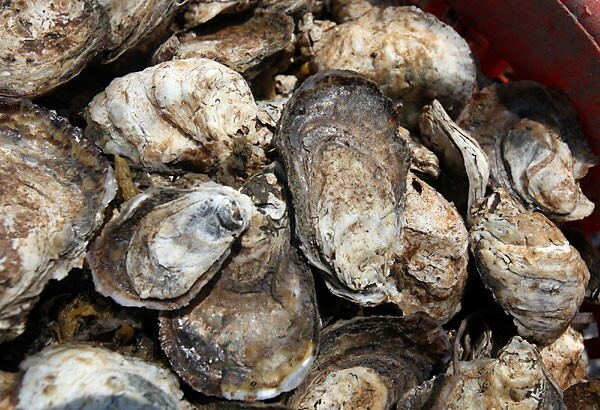 For example, our smaller oysters are more popular in New England,” added Hudson. If you’re a little nervous about eating oysters start small, you can always work your way up to something like the chunky dunker if you choose. Sauces and Garnishes: Often times you will hear seasoned oyster eaters say that they enjoy the first oysters on their plate without garnishes, and in fact this is a really great way to taste the full flavor of the oyster. The juice inside the oyster, known as liquor to shellfish aficionados, is an essential part of the oyster tasting process. In fact, shuckers are trained to not only open your oyster but to ensure that the small pool of clear liquor remains in the bottom of the shell for your tasting pleasure. Once you have tasted the liquor and the oyster you may decide to try some garnishes. “Most oyster bars will provide you with items to accent your oysters; these garnishes include lemon, cocktail sauce, horseradish, and mignonette sauce,” said Rappahannock Oyster Bar manager Jean Paul Sabatier. For those not familiar with mignonette, it is a typical garnish for raw oysters made from red wine vinegar, minced shallots, and often times cracked black pepper. It is not uncommon to add Tabasco or hot sauce to oysters and many shellfish establishments have these garnishes available for customers. When You’re Done: Now that you have tried different types of oysters and different garnishes, you will have a plate full of ice and empty shells in front of you. Some folks like to flip their oyster shells upside down to signal that they are finished, while others leave them facing up. Either way, the oyster’s job is not done yet! Many oyster bars and restaurants participate in shell recycling programs and the shells that you have just emptied out will be set aside to cure for upwards of 12 months and then placed back into waterways to create the next generation of shellfish. “Natural oyster shell is one of the best materials to raise new oysters and restore oyster reefs; the shells are a limited natural resource and a valuable tool for improving waterways and oyster populations,” said University of Maryland Sea Grant Agent Don Webster. The adult shells are an essential part of providing habitat for new larval oysters to attach to and grow. It’s not like oysters can pack up and walk away if their habitat choice is ill-suited so providing a stable place out of the mud is key to growing new wild oysters. If you order oysters, ask if that restaurant donates them to a place that uses them to reseed oyster beds! In Virginia Beach local restaurants donate used shells to Lynnhaven River Now which is at the Brock Environmental Center. Can anyone tell me where they are donated on the Eastern Shore?